I am new so please do not rip me apart for my ignorance. I have a Boxter s (2002) and the fuel gauge is stuck in the full position, I have driven it for a few weeks and done a few fill ups to see if this would have shifted it back into working order. 1. Is it a DIY fix? 2. If not DIY what costs would I be looking at to repair/fix? This is a diagram of the system. The level sending unit is #5. The pump attaches to it (#4). 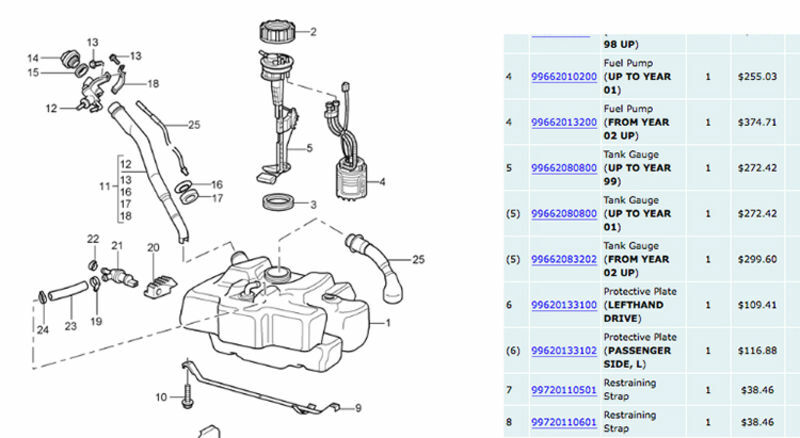 I included the parts numbers for your reference. Last edited by thstone; 10-29-2017 at 08:26 PM.